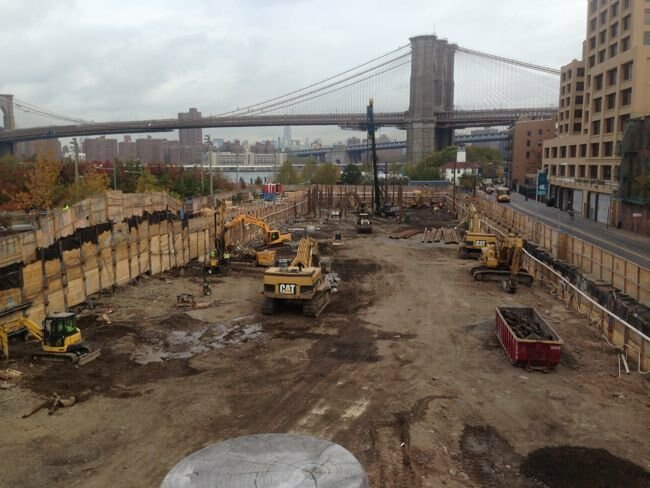 There’s a whole lot of construction going on at breakneck speed down at Brooklyn Bridge Park. 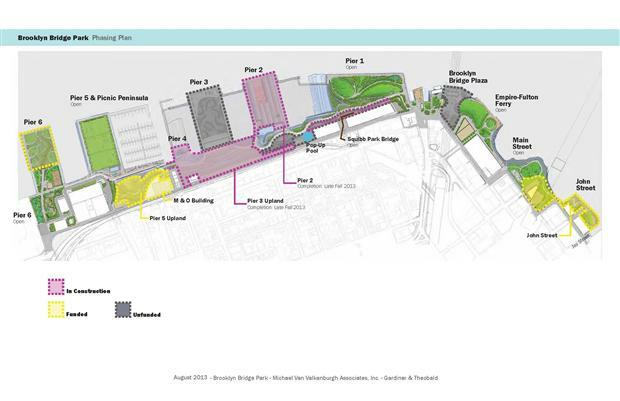 My theory is that Mayor Mike Bloomberg is rushing to finish the middle section of the park — the bike path, more amazing landscaping including a 30-foot soil sound-berm, and perhaps the landscaped park planned for Pier 3 — before he leaves office Dec. 31. Soil berm that will be covered with grass. Grass and landscaping is now complete along the water. On the left, Pier 2, which will be landscaped, and on the right, Pier 3, which will have sports facilities. The section of the park moving the most quickly is the landscaping and bike path that the city is calling “Pier 3 Upland,” which is the continuation of the bike path between Pier 6 playground and Pier 1. 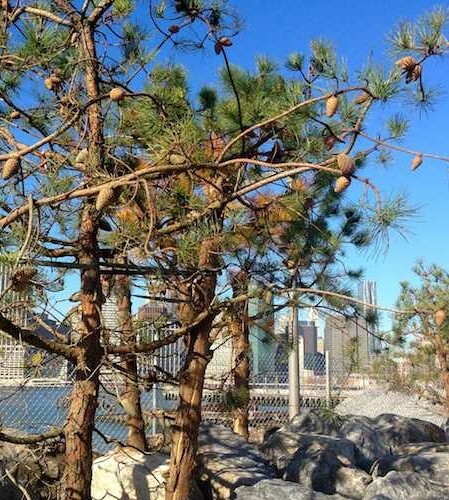 Pier 1 is the large, wide, hilly section of the park near Fulton Ferry Landing and Dumbo. In any event the park is looking awesome, and every week there seems to be progress. 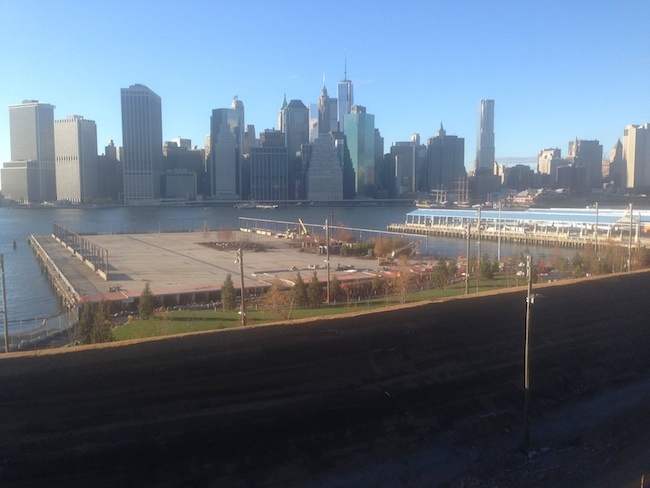 Workers are completing and adding drainage to a two-story dirt berm that’ll be covered with meadow grasses and plantings to serve as a sound barrier, protecting the park to some degree from noise and grit from the Brooklyn-Queens Expressway. The bike path looks mostly complete, with trees and undulating grass hills alongside it. Work is also chugging along at Pier 3, jutting out into the water. Pier 3 is slated for completion this year, according to the park’s website (one wonders if they can get it done), and will feature grassy areas and landscaping for free playing, fishing areas and fish cleaning stations and playground equipment. Nearly completed grassy landscaping, and planted trees, between Pier 3 and the bike path. Pier 2 with its blue rain shields is to the right. 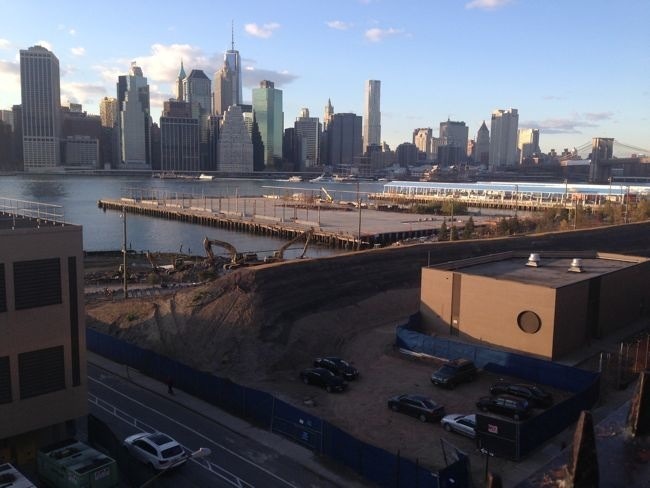 Pier 2 — slated to be a sports mecca — is showing progress but does not appear close to completion. Designers have incorporated the old storage sheds on the pier as part of the final design, to serve as rain and wind barriers. 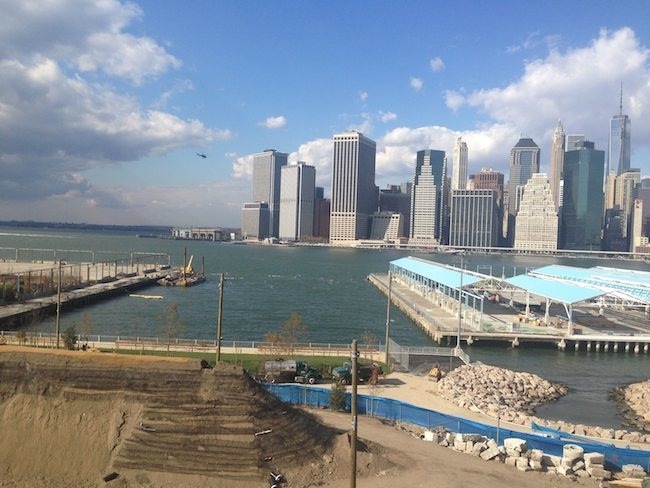 Pier 2 is approximately 5 acres, and is scheduled for completion in early 2014, according to Brooklyn Bridge Park website. It’s going to feature courts for basketball, handball, and bocce; a full size in-line skating rink; swings; picnic tables; restrooms and fitness equipment. And then there’s the massive construction site on either side of Squibb Bridge, which connects the Brooklyn Heights promenade to Brooklyn Bridge Park. Here, Two Trees is constructing a hotel and luxury condos. Check out this Post article to see renderings of the hotel/condo development. For more details, check out the park’s construction blog.